. Published on January 24, 2019. Keeping your personal information safe should be a priority for anyone using the internet. This is because it’s easier than ever for hackers and scammers to get hold of personal information if the right security isn’t in place. Defending yourself isn’t very challenging or time consuming either. It’s actually rather simple. So why does so much personal information get exposed? It’s common for the public to place all the blame on the companies and websites getting hacked. They have plenty of resources, they should be able to handle security right? Well we think that’s a bad mindset to have (and frankly a little naive). 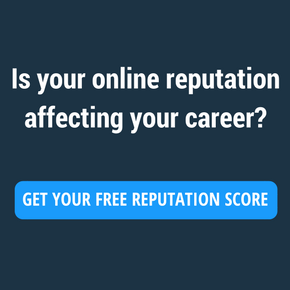 You need to be accountable for your personal information. It is yours after all. Yes, Marriott and Equifax should take responsibility for sloppy security measures when their data gets exposed. We’re not passing the buck here. But you need to be realistic. Companies and websites are going to continue getting hacked. That’s not going anywhere. More and more businesses are viewing your personal information as a commodity that can be bought and sold. They sell it to advertisers or other businesses for the sake of marketing their products and services more effectively. This means when you submit your info to one site it’s easier than ever for it to end up somewhere else. That’s a scary concept if you’re concerned about keeping your information safe. Because of this, we wanted to put together this simple resource to help navigate the waters. It’ll lay out everything you need to know about personal information and what needs to be done to keep yours safe. Personal information is any piece of info that can be used to identify you. This is a rather broad definition, so let’s break it down with some examples. The standard identifying info: The most common pieces of personal information belong in this category. Examples here would be your name, age, birthday, address, phone number and gender. Ethnicity focused personal information would fall in this category as well. IDs: Your social security number, credit and debit card numbers, and PIN numbers are common targets. Health information: Medical and health records, disabilities, family health history, and prescriptions are commonly found examples. There’s much more that can be found regarding your health depending on the source. Finance: Personal information in this category that’s often pulled into third party databases are your income, loan history, credit data, and lists of transactions. 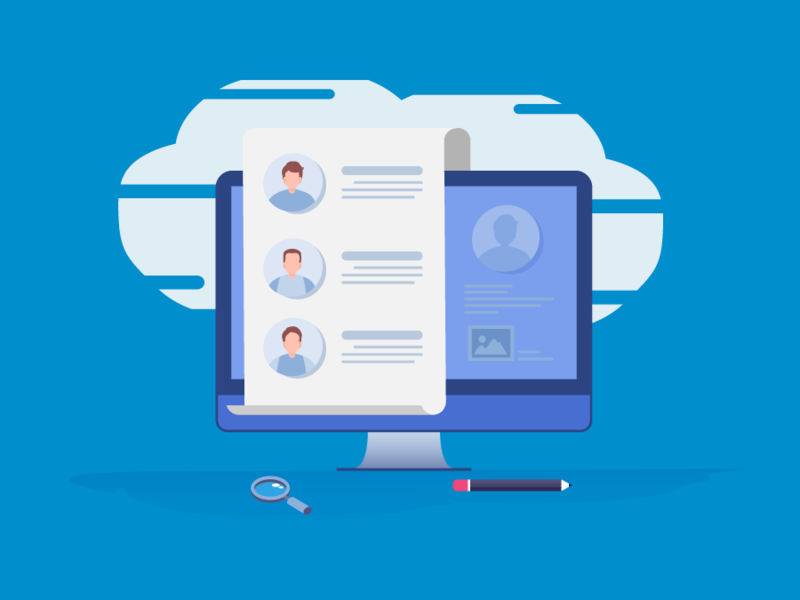 Employment: Employment history is another example of personal information that exists for almost everyone. This can vary from your complete work history to smaller details like references and reviews. Criminal history: This is personal information that can be very damaging to someone’s reputation if exposed. Charges and convictions are the most commonly found kind of info in this category (and also the most damaging). Education background: It’s not uncommon for education history to be floating around on the web as well. This will commonly be an overview of where you went to school and what degree you earned, but in some cases it can get more detailed. As you can see, there’s a LOT of personal information that can be targeted or used by third parties. This is just summary too, there’s much more if you want to get picky about it. It means unless you’ve been living off the grid and getting paid strictly in cash, you have personal information that could potentially get exposed in the future. If you want to be smart about keeping your personal information safe and secure, there are some steps you have to take. The good thing is it’s not very complicated! Your personal information should be treated like gold these days. It can be used in a number of ways that can cause a lot of damage to your life. As we hinted to earlier, there’s no shortage of hacks and data breaches going around. Not only has this been the trend up to this point, but it’s going to continue (and likely get worse). This is the cost of living in the information age. With such a premium being placed on personal information, there are plenty of unsavory individuals who will do whatever it takes to acquire access to it. 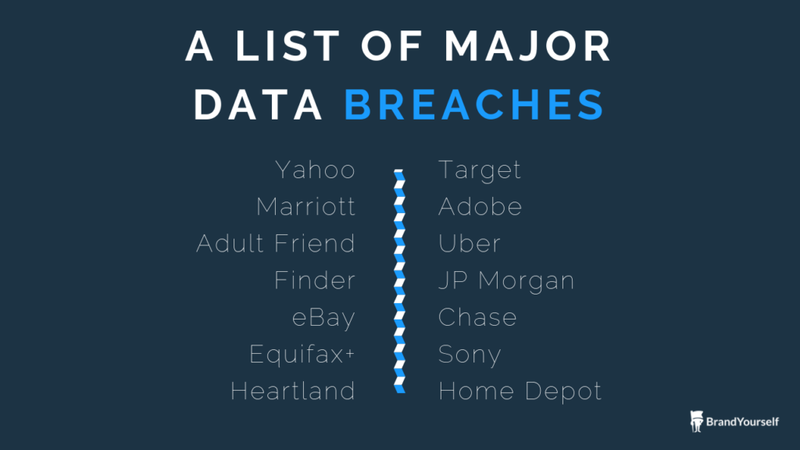 Now you might think that as security gets better, the frequency of these breaches should decrease right? As security gets better, so does the technical prowess of hackers and spammers. It’s a constant battle between the two sides to gain an edge and it’s unlikely that it’s going to slow down. But it’s not just criminals who want to take advantage of your personal information. Companies like Facebook and Google want as much of your personal information as possible. And it’s not out of the goodness of their heart. They will pitch it as a way to create a better, more personalized user experience. If you watch any keynote speech from these massive companies you’ll hear this phrase thrown around a ton. This narrative is an attempt to control the narrative and maintain a positive public perception of what they do (and it probably fuels their ego a little bit too). They’re taking your personal information and using it to make money. Plain and simple. Sometimes it’s done by selling it to advertisers or giving them more effective ways of targeting their ads. Other times it’s done for the sake of keeping their users on their site longer, so they can sell more ads. If your personal information didn’t make them money, they wouldn’t want it. This is how things can get out of hand. Businesses want more of your info and more revenue. When this is the primary objective, your security stops being a priority. That leads us to more hacks, more breaches, and more privacy violations. Fortunately, there are some rather simple tactics you can use to keep your personal information out of the public eye. Personal information aggregators (or “data brokers”) are sites that collect and share your info as a service to their visitors. You might hear these be referred to as people search websites, and Whitepages or True People Search are two popular examples. These sites search the web and public records looking for your personal information that they can add to their databases. They’re constantly looking for more, and many of them get quite a lot of traffic. This means that anyone with an internet connection can visit one of these sites and look up your personal information. Commonly you can find names, addresses, family history, and email addresses on these sites. In order to keep your personal information safe and remove yourself from these sites you have two options. You can either opt out from each of them individually (your info is likely on dozens of sites) or you can automate the process with tools instead. No matter what you choose to do, it’s important that you get off these sites. They exist solely for sharing personal information and you will always be at risk as long as you can be found on them. A large amount of personal information that gets exposed is provided directly by the victim on social media. Fortunately this is a pretty easy thing to avoid doing. First of all make sure to never post any personal information at any cost. Even though you might think you can trust your network, you’re more vulnerable than you think. You could be friends with or followed by a fake account, or someone in your network could get hacked. This happens all the time. As long as you keep your feed free of info that could identify or be used against you, you’re going to be a lot safer. Also don’t give away too much in the “bio” or “about me” section of your profile. The less you share, the better. Get familiar with the privacy settings on whatever social networks you use. Create custom lists of what people can view certain posts, or just set everything to private. Doing this will drastically cut down on the number of prying eyes that might be looking for your personal information. Another quick way to bring a little more security to your personal information is by using multiple email addresses for your various online accounts. Emails are usually the first kind of personal info to get exposed in a data breach, so not tying everything to one account is smart. A common setup that works well is to have one email account that is tied to any of your most important profiles and duties you do online. This could be for your banking and financial services, or business as well. Then another email account for personal use (sending e-cards to grandma or social media) to diversify things a little bit. Some people will even have an email account they dedicate entirely to dealing with spam or infrequent signups they have to go through. By keeping your most important account tied only to the most reputable and reliable sources, it’s far less likely that it will end up being compromised. Choosing strong passwords is another easy way to keep your personal information safe online. A surprising number of people choose downright terrible passwords for the sake of simplicity, without realizing it’s making them significantly easier to hack. There’s a reason why a lot of important websites recommend that you choose a lengthy mixture of letters, numbers, and symbols when creating your password. They aren’t suggesting it just to annoy you. There are a number of tools that help you manage various passwords, but we honestly don’t like the idea of using them. That means your passwords are only as safe as the tool you use. Instead, choose a couple difficult passwords and change them every month or two. This will make it easy for you to memorize them, but also keep you safe. It might seem like a pain to do this, but your personal information is worth it. Your old electronic devices are full of personal information until you take the proper steps to remove it. Too often people will either sell or scrap their old phones or computers without taking this step, and it comes back to bite them. If you’re not doing a full factory reset and wiping all hard drives you’re at risk. If you’re not selling the your old device and want to be extra safe, get out a hammer or drill and go to town. You should still wipe it first, but smashing your old hard drive into a million pieces is an effective guarantee that no one will be able to use it. If you’re going to be making any purchases online (which is a near certainty these days) you should pay attention to the site you’re on. If you’re buying some Scandinavian mitten warmers from Amazon you’re going to be fine. But if you find yourself shopping around for essential oils on the site your cousins sister-in-law threw together, you might want to think again. The first and easiest thing to check for is if the site is “HTTPS” instead of “HTTP.” You can find this by looking at the address bar in your browser. It will be on the far left of the URL. This isn’t foolproof, but it does mean there’s extra encryption and security on the site you’re shopping on. If the site isn’t HTTPS, don’t make the purchase. Two factor authentication is a way to safeguard against unwanted actions online. Typically this will be used during the login process. What happens when you use two factor authentication is you’ll enter your standard login details to start. But instead of the process ending there, you’ll then receive a code (usually via text message) that you have to enter before you can log in. This prevents anyone who might have your login information from being able to access your account. Not only that, but since you’ll receive a code notification that you didn’t request you’ll be aware of this. That means you can take the necessary steps by changing your password and making sure other personal information wasn’t accessed. This might seem obvious but it works like a charm. Having fewer accounts and websites that you submit your personal information to lowers the chance of your personal information being exposed in some sort of data breach. 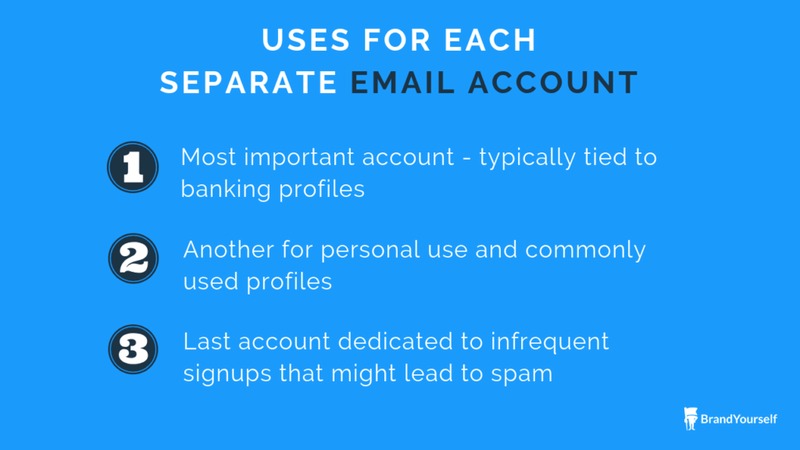 If you’ve already created a bunch of accounts it’s not too late to do some spring cleaning. What we recommend doing is deleting your account and submitting a GDPR request for the website to get rid of any information you’ve submitted. They legally have to comply so all you need to do is send an email. Most of us have a long list of sites we’ve signed up to, but never use. If you can cut those out of the picture your personal information is going to be a lot better off. Your personal information is something you should never undervalue. In this day and age the likelihood of someone attempting to capitalize on your personal information at your expense is high. Having an understanding of the landscape and how you can stay safe will make a huge difference. You should always try to look at the web through this lens. Getting lazy or letting your guard down is a quick way to have your address and phone number searchable by anyone online. But if you follow the steps we recommended you’ll be far less likely to have anything happen to you.